Traditional Christmas diners in Holland tend to follow a certain pattern: a shrimp or seafood cocktail to start with, followed by a soup (either clear or cream), the main dish accompanied by wintery vegetables like red cabbage, Brussels sprouts, potatoes in some way, shape or form and finished with ice cream and fruit or stewed pears with hangop. Past diner, coffee with bonbons is served and sometimes even a small "borrel", such as Dutch gin, or something sweeter for the ladies. Nowadays, this pattern can vary. As we've become more casual with festive holidays, some people replace the whole dinner rigmarole with their favorite foods. In some of the forums online, many have confessed to just making boerenkool met worst, a typical Dutch kale and mashed potato dish with kielbasa. And why not? Christmas is after all what you make it. But in traditional settings, and on the menu of Dutch restaurants that offer a multiple course diner on Christmas Day, you'll find a similar pattern as the one described above. The main course is often wild, or game meat: venison, deer, or smaller game like hare or rabbit. 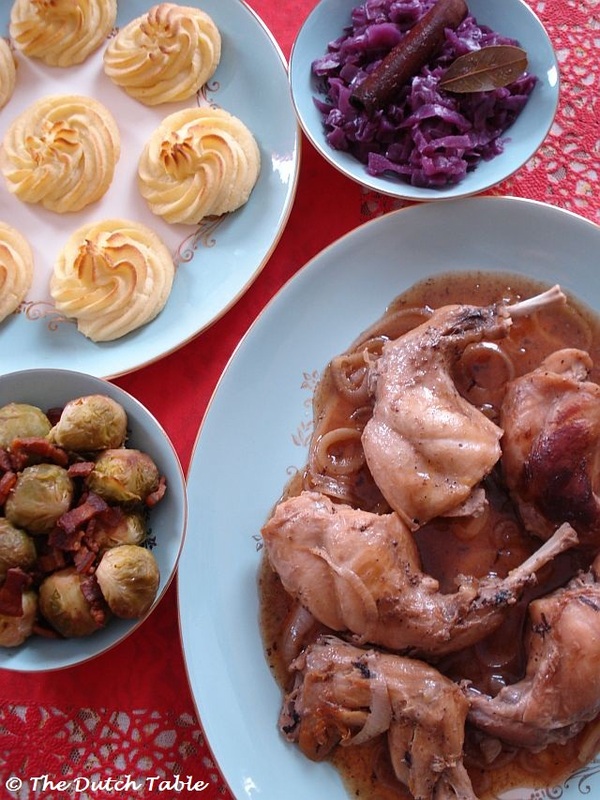 Rabbit for me is the ultimate Christmas dish. 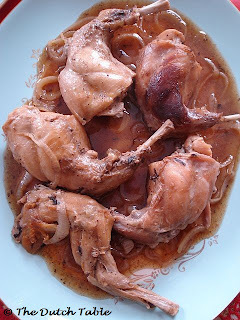 For as long as I can remember, Christmas dinner consisted of a sweet and tangy rabbit dish my grandma Pauline used to make. It was something we all looked forward to, every year, as it's usually not a dish that's served any other time of the year. We all used to gather at her home in Limburg and on Christmas morning, that sweet tangy smell would emanate from the kitchen, and all would be well. Grandma Pauline is no longer with us, so we're all spending our holidays elsewhere. Since I'm spending Christmas at home this year, here in the United States, I wanted to make sure I found some rabbit to keep the tradition going. Several years ago it was more difficult to find, but slowly our meat selections are changing: goat, lamb and also rabbit are now easier to find than before. 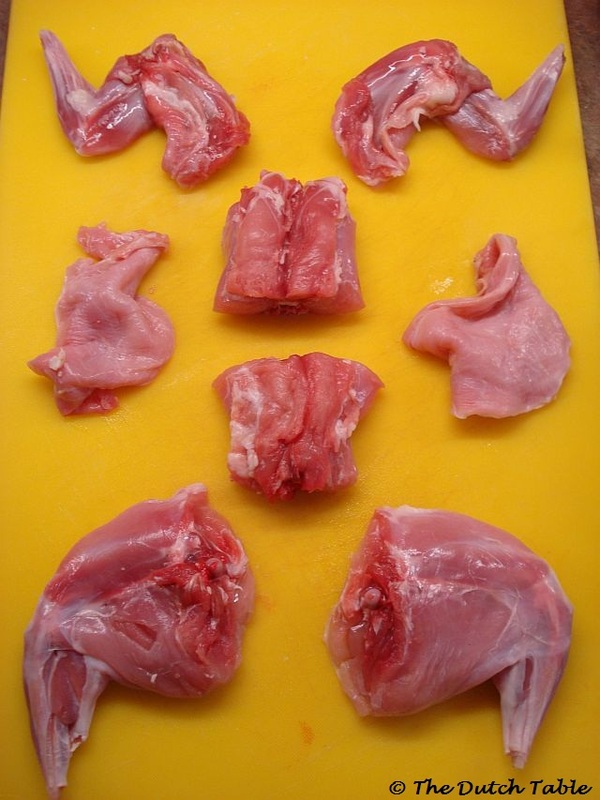 Call around to some of your local butchers to see if someone carries rabbit. Ofcourse rabbit during Christmas conjures up images of sad little children and eating pets. Youp van 't Hek, a Dutch comedian, once wrote a song called Flappie, about a boy whose rabbit went missing on Christmas Day. Father urged him to stay away from the shed and later, during Christmas dinner while serving the meat, callously remarked that Flappie was found after all. The next day, the little boy urges his mom to stay away from the shed when she comes looking for her husband. A recognizable story (the rabbit part), especially during the difficult war times, with a gruesome twist. So yesterday, I was in my kitchen cutting up this animal. It was a little unnerving because neither the head nor the tail was on this pink carcass. Enough for my mother to venture the thought that perhaps it was cat after all: it was not unheard of during the war years to buy "rabbit" in the stores and have a diminishing feline population at the same time. 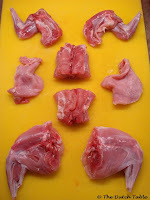 These pieces of meat were called "roof rabbits" among the people in the know...... Anyway, back to the bunny. The main meat on the rabbit is going to be the legs. The front legs are easily cut as they are not attached to the main body. Cut the saddle (the rabbit bacon) on the side, and remove the rib cage and the pelvis. Cut the hind legs off, just like you do with a chicken, half the loin part and you're good to go. For those of you that have never had rabbit....it tastes a little bit like chicken. Seriously. Cut the rabbit up. Make sure you remove small bones or splinters before cooking the meat, they can be nasty. 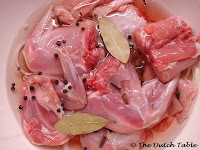 Add the water, vinegar, bay leaves, peppercorns, cloves and slices of onion to a large bowl and add the pieces of meat. Cover and refrigerate overnight. The next day, take the meat out of the marinade and pat it dry with some paper towels. Heat two tablespoons of butter in a Dutch oven and quickly brown the meat on all sides. Remove from the pan, brown the onions and add the meat back in. Pour the marinade over the meat but keep the peppercorns behind, they are a pain to remove once the sauce is made. Bring to a boil, turn low and simmer for about 30 minutes. Remove the meat from the pan, scrape all the brown bits from the bottom of the pan and add the appelstroop or brown sugar and the second cup of water if needed. Bind the sauce with a tablespoon of flour and 1/3 cup water, taste and adjust with salt and pepper. Add the meat back to the sauce and simmer for another hour or until the meat is tender to the point where it falls off the bone. Serve with boiled potatoes or pommes duchesse and red cabbage. Zalig Kerstfeest, everyone! Slagroomtaart - We vieren feest!